Scientists from Brazil explored mRNA and protein public databases to unravel hidden meanings of the genetic code. Scientists from Brazil explored mRNA and protein public databases to unravel hidden meanings of the genetic code. Using a metric derived from mRNA codon composition, they found out how gene sequence choice can predict different aspects of protein synthesis, such as protein production efficiency. The study could help the development of new biotechnological applications of genes and proteins. The genetic information contained in the cell nucleus in the form of DNA is copied in messenger RNAs (mRNAs). Different from the DNA, mRNAs are dynamic and unstable molecules that leave the nucleus and are translated by the ribosomes, the molecular machines able to convert a sequence of nucleotides that make RNA (and DNA) into a sequence of amino acids that form proteins. Each amino acid corresponds to one or more combinations of 3 nucleotides -- or codon. Because the same amino acid can be translated from different codons, the genetic code is described as degenerate (or redundant). Brazilian scientists synthesized apparently disparate pieces of data and extended our knowledge of how gene sequence choice can predict different aspects of protein synthesis, such as mRNA stability and production efficiency. A research group led by Fernando Palhano and Tatiana Domitrovic at the Federal University of Rio de Janeiro used a metric derived from mRNA codon composition to compare the existing data to different cellular parameters. They found that this metric correlated well with protein abundance and protein production efficiency, indicating the most coherent mRNA decay datasets. Their work reiterated that mRNA degradation is somehow connected to protein production efficiency. "Even proteins needed in high levels under specific conditions, such as stress response, have their gene sequence optimized for efficient translation," says Fernando Palhano. Fernando and Tatiana worked with Rodolfo Carneiro and other colleagues, who identified a group of low abundance proteins coded by a non-optimal subset of codons. As they show in their paper, codon choice is vital not only to guarantee high protein production but also to tune down the output of proteins that should be produced in minimum amounts, such as regulatory proteins. The amount of protein produced in a cell is crucial to maintaining the organism function -- "Many human diseases are caused by inefficient or unbalanced protein production, such as cystic fibrosis and cancer," says Tatiana. She adds that "from a practical perspective, understanding the relationship between the genetic sequence and protein production can have a profound effect both on medicine and bioengineering." The authors note that many "silent" DNA mutations, that is, mutations that alter the codon sequence, but not the coded amino acid, can lead to significant modifications on protein production rates, which could lead to disease. By carefully selecting the gene sequence one can finely tune the protein production and boost biotechnological applications of genes and proteins. Illustration: The CSC for each of the 61 amino acid coding codons equals the correlation coefficient (r) derived from Pearson's correlation between the frequency of occurrence of each codon in the transcriptome and the mRNA half-life values. 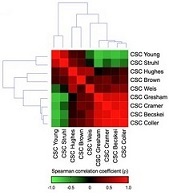 Each mRNA half-life dataset generated 61 CSC values that were used to compare the studies. The heat map shows Spearman's correlation coefficients (ρ) ranging from –0.64 (negative correlation, green panels) to 1.00 (positive correlation, red panels). Nucleic Acids Research.